There are many ways to squeeze information from a photograph, some of which have nothing to do with the contents of the picture. So if you are expecting an article on how to identify a photo by the clothes the people are wearing (or anything else you see in the picture), you are in for a surprise. One interesting clue to dating a photograph is normally invisible. In the mid 1950s, some manufacturers of print paper began to dope their products with fluorescent dye to make them appear whiter. If you expose prints made on doped paper to ultraviolet light, they will glow. You can easily obtain an ultraviolet lamp at a hardware store or a nursery, as this kind of lamp is often used to grow African violets. 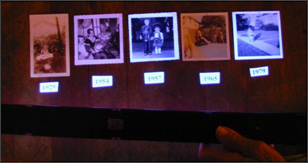 Figure 1 shows a series of photographs produced between the late 1920s and the mid 1970s, both in normal lighting and under an ultraviolet lamp. The first photograph on the left, taken in 1927, looks very dark, as does the fourth one from 1965. The second one, taken in 1954, seems to be brighter, but it is not glowing. It is likely that the ink used to print this photograph contained violet pigment, and that the spectrum of the ultraviolet lamp extends into the violet. The third photograph, taken in 1957, and the last one on the right from 1979, are both glowing. If a photograph glows under ultraviolet light, it was manufactured after the mid 1950s. If is does not glow, you cannot say when it was produced. Not all print papers were doped with fluorescent dye. Sharing photos online is fun, and a good way to distribute family pictures to relatives who may be able to identify them. Yet there are drawbacks to this. When a photograph is scanned, its original dimensions are lost. Yet the size of a photograph can still be used in analyzing it as long as it has not been cropped and the shape of the picture has not changed. Every camera creates photographs with a characteristic aspect ratio (ratio of the length to the width). No matter how a photograph is enlarged or reduced, its aspect ratio remains the same, so that it can be used to identify the model camera used to produce it. The date that model went on the market is the earliest date the photograph could have been taken. In 1900, George Eastman revolutionized photography with the introduction of the Kodak Brownie Camera. For the first time, anyone could become a photographer without advanced technical knowledge. At a cost of $1 ($20 today), the Brownie was also affordable by the general public. It took Eastman Kodak only five years to sell over a million cameras. Many other Kodak models followed. During the first few decades of the 1900s, Kodak had a virtual monopoly on the home photography market. Most photographs that were not taken in a studio were taken with Kodak cameras, each of which produced pictures with a characteristic aspect ratio. The photograph of Thomas Charles Goodwin in Figure 2 was sent to me by his great grandchildren Paul Brown and Lynn Brown Stehling, who asked me to help date it. The poster on the wall behind Thomas is bordered by sketches of the U.S. Presidents, running clockwise in chronological order. George Washington is in the upper left corner of the poster; right below him is Teddy Roosevelt, who served between 1901-1909. The poster was probably printed while Roosevelt was in office. But this is not an article about how to date a picture by its contents, is it? The aspect ratio of the photograph on my computer monitor was 6/3.5 = 1.7, or 6? high by 3.5? wide. According to the website www.brownie-camera.com, the earliest camera that produced photographs with this aspect ratio was the Kodak Model 3A Pocket Folding Camera. (Figure 3) The Model 3A was not available until 1903, giving this as the earliest date for the picture. Remember to Look at the Back! One of the first things I do when I get a new photograph is to turn it over and look at the back. There are many potential clues you may find there, including lot numbers, brand names, and personal marks left by the person who developed the picture. Sometimes you may find something more unusual. The photograph with the most remarkable back that I have ever come across is this one taken in 1893 of the Heywood Family of Westminster, MA. (See Figure 4) It was sent to me by John Roberts, a founding member of the History Posse in Vermont. 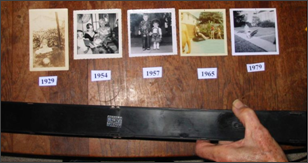 The Posse rescues old photos orphaned by antique stores and estate sales and makes every effort to return them to their families. The first unusual characteristic of the picture is that the names of all the people are written on the back. (What is the chance of that happening?) The inscription identifies the woman in the picture as Catherine Heywood, born May 30, 1833. 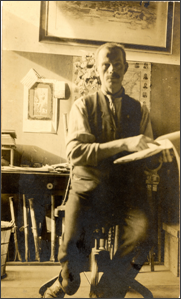 The original photograph of the man was probably a platinotype - a kind of photograph available in the 1880s that used platinum as an ingredient in the emulsion. Platinum can cause chemical changes in paper with which it is in contact. In this case the image of the young man was burned into the back of the mat of the Heywood portrait as the two photographs lay in contact with each other for many years. This was an exciting discovery but it raised a question about the identity of the young man. John noticed immediately that the man was a silk screener by his muscular arms and the squeegee he is gripping in his hands. By coincidence, John had worked at this profession for over a decade. 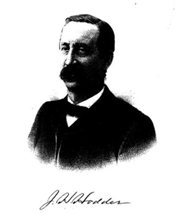 As John researched further, he discovered that Catherine Heywood married John H. Hodder. He found a portrait and a biographical sketch of John Hodder on p. 433 of Biographical and historical record of Kane County, Illinois. And guess what John Hodder did for a living? He was a silk screener! It is possible to compare the photograph of a known person with one of someone who is unidentified and rule out that they are the same person if they do not resemble each other. However, it is not possible to say with a 100% certainty that they are the same person even if they look very much alike. The unknown person could be a close relative or even someone who is completely unrelated. The best that can be said in comparing two similar photographs is to state that "to a high degree of certainty" they are the same person. There are noticeable similarities between the photo of the younger man and that of John. They have the same hairline and similar brow ridges. These two features are important in comparing people because the features usually do not change much during a person's lifetime. Even if a man loses his hair as he ages, his hairline will usually retain some of its original shape. Note that the two men also sport thick moustaches. 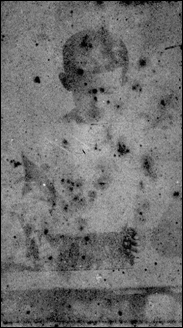 In this case, there is additional information that increases the chance that the residual image is that of young John Hodder. Both men were silkscreeners, and the image of the younger man was discovered on the back of a portrait including Catherine Heywood, the wife of John Hodder, indicating that the two photographs had been stored together for a long period of time, and that they probably came from the same estate sale. I think it's fair to say that "to a high degree of certainty", the transferred image is that of John H. Hodder as a younger man. If you are surprised that a photograph can be analyzed by its fluorescence, its shape, and by what appears on the back, just imagine what you could learn by studying the image!